Heads up! There is going to be a great deal at Publix starting 10/26. 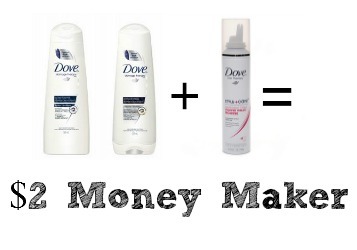 The deal is from the Personal Care Flyer and allows you to make $2 for buying Dove hair products! One of the $1.50 off coupons expires 10/27, so you’ll need to shop Sunday to get the best deal. If you can’t go then, you can use the $1 off coupon from the October All You Magazine and still get a $1.50 money maker! Check back later today for all of the deals in the new Personal Care Flyer! Keep in mind, Bi-Lo will take the Publix coupon. If you wanted to do the deal there instead, everything would still be free. The Dove Hair Care was $4.99 at my store. See all of the current Publix Deals.